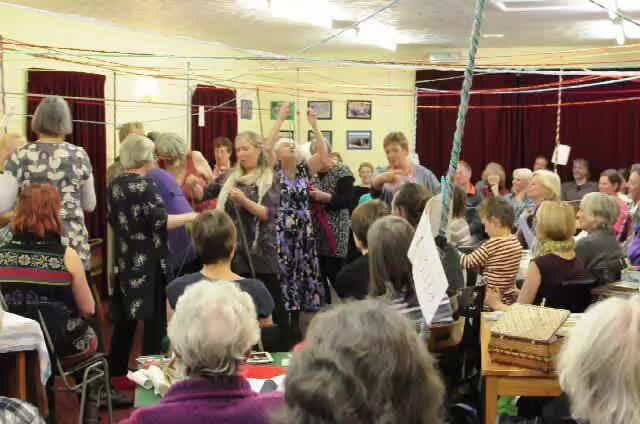 Grandmothers brought together grandmothers from the neighbouring towns of Dartmouth, Totnes and Paignton. Fifteen grandmothers with an age span of over forty years met fortnightly over five months to share their experiences of being grandmothers as well as their hopes and fears for their grandchildren and the world they are inheriting. Experiences, ideas and thoughts coming from the group were woven together to create a public performance event that toured to the three towns in October. Day long sessions included: creative writing, performance, making, journaling, and research. All the content for the performance was generated by the Gradmothers themselves emerging from weekly themes including; Birth: Death, Invisible: Visible, Inside:Outside, Freedom:Responsibility, Fight:Defeat, Past:Future, Youth:Age, Sickness:Health. The final comic-tragic interactive performance event was created by Encounters in collaboration with the Grandmothers and took place in Paignton Enterprise Centre as part of the Doorstep Theatre Festival, Dartmouth Flavel, and The Boat Club in Totnes. The project was directed and facilitated by Encounters Creative Director Ruth Ben-Tovim herself a younger Grandmother working with playwright Sarah Woods and visual artist Sophia Clist. It was funded by Arts Council England with kind support from Dartmouth Flavel.